A sheet from The Making of Florilegium Solmentes: Nature prints & digital Flowers that will accompany ten sets of the portfolio; twenty copies will be offered for sale separately. The book includes eight original prints from leaves, (two with watercolour washes). 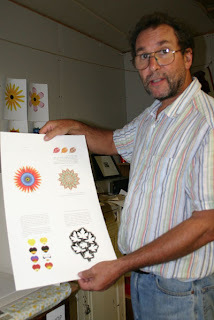 It describes how the digital flowers were created using image-editing software and how the geometry of the flower led to some interesting diversions into the world of mathematics, optical illusions and pattern making. Florilegium Solmentes is a portfolio of unique ‘digital’ flower prints created from ‘nature prints’ of leaves, from scanned petals and from other parts of plants found on our farm near Decorah in northeast Iowa. Some flowers are wholly imaginary, others are loosely based on real specimens.